Force Public Relations Officer, Mr Jimoh Moshood, paraded the suspect identified as Ismail Yakubu on Wednesday at the Police Headquarters in the nation's capital. He also revealed the names of the four police personnel allegedly involved in the raid of Clark's residence in Asokoro on Tuesday. 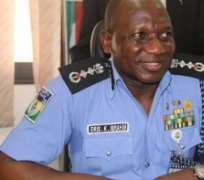 Four police officers allegedly from the IGP's Special Tactical Squad had stormed Clark's residence in Asokoro, Abuja with a warrant to search for weapons.